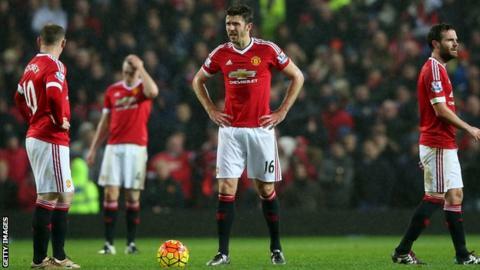 Manchester United midfielder Michael Carrick says it is "disrespectful" to claim the club's players are not trying their best for manager Louis van Gaal. United's Boxing Day defeat at Stoke was their fourth in a row and extended their winless run to seven games. Van Gaal, who says he could quit, was at United's training ground on Sunday. "It is a bit disrespectful when people say the lads aren't trying for the manager," said Carrick. "That hurts us - it's not the type of people we are." The United vice-captain added: "We haven't won games and it is fair enough if people criticise things that have gone wrong on the pitch. "It is a horrible run, and it is a horrible feeling. It hurts badly. "The run we've been on is just not good enough. We can't hide from it, we're not going to hide from it. That is how it is and we all need to be better." United have lost four successive competitive matches for the first time since November 1961, and their winless streak of seven games - which has seen them knocked out of the Champions League and slip out of the top four in the Premier League - is their worst run since the 1989-90 season. Van Gaal's side face Chelsea at Old Trafford on Monday, with midfielder Bastian Schweinsteiger available again after returning from a three-match suspension. The Dutchman admitted it would be hard to lift his players for the game against Chelsea. "When you lose four matches in a row it's much more difficult," said Van Gaal. But asked whether he thought the players still believed in him, the 64-year-old added: "Until now, I can say 'yes'." One United player to have suffered from a lack of form in recent weeks is Netherlands striker Memphis Depay. The 21-year-old, at fault for Stoke's opening goal, was withdrawn at half-time on Saturday and has scored just two league goals since arriving from PSV Eindhoven for £31m in June. Chelsea's interim manager Guus Hiddink believes Depay is suffering from the pressure of having to adjust to English football. "He has this talent but he's also now having a confrontation with the demands of the Premier League, which are much higher in the intensity of the game for 90 minutes," the Dutchman said. "Those guys, they need a bit the cover of experienced players."